A new study by a Florida State University biologist shows that bleaching events brought on by rising sea temperatures are having a detrimental long-term impact on coral. Professor Don Levitan, chair of the Department of Biological Science, writes in the latest issue of Marine Ecology Progress Series that bleaching—a process where high water temperatures or UV light stresses the coral to the point where it loses its symbiotic algal partner that provides the coral with color—is also affecting the long-term fertility of the coral. "Even corals that didn't bleach aren't reproducing at the levels they should," Levitan said. Most corals reproduce by releasing sperm and eggs into the ocean during brief annual spawning events. The chance of sperm finding and fertilizing an egg depends on corals spawning in close proximity and in synchrony with each other. In a study of the corals that build the major framework of Caribbean coral reefs, Levitan's team found that the species living in shallower water experienced near total reproductive failure, while the species living in deeper water was about half as likely to spawn. "The remarkable finding from this study was that the reduction in spawning persisted for three additional years, long after the corals had regained their symbiotic partners and regained their normal appearance," Levitan said. The worldwide decrease in coral abundance in combination with long-term reductions in spawning and reproduction following bleaching events put reef- building corals in a difficult situation. Eggs might be released, but never fertilized. And that could have a major impact on the ecosystem at large. Levitan's team has been studying coral that is just off the coast of Panama since 1996. 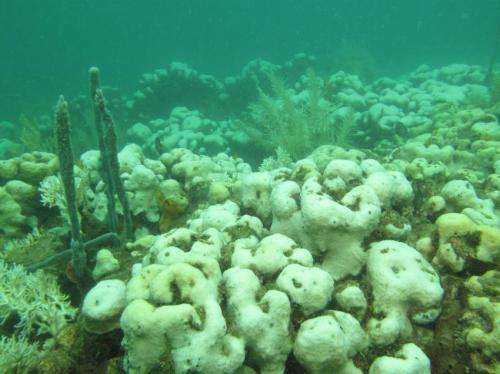 And since then, those corals have been exposed to two bleaching events. On average, it takes coral three to four years to recover from bleaching. "Even if we can fix what's killing these corals, it's going to be hard for coral populations to recover, because the surviving corals might not successfully produce enough offspring to repopulate reefs," he said. The coral in that region is critical to building reefs, a crucial part of local ecosystems. "There's a variety of reasons why people should care about this," Levitan said. Coral reefs provide protection and shelter for many different species of fish. Without the reefs, certain fish are left homeless and without an area to reproduce. They also protect coastlines from large waves and flooding, a major issue in areas that are prone to tropical storms or hurricanes. In the future, Levitan said his team would like to examine the quality of gamete production and also determine if corals that have already bleached are more or less likely to bleach again. We can survive without an economy, but not without an Environment to make our Oxygen, clean our water, and provide us with food.